, retail sales data include purchases by the government and other public agencies. Second, a large and growing share of private consumption expenditure is on services, which are not covered in retail sales data. 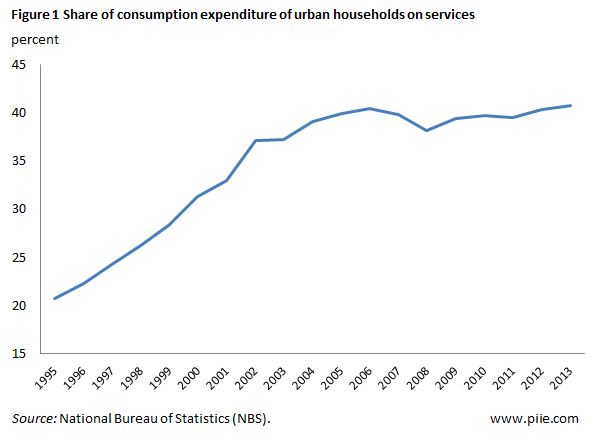 The service share of consumption expenditures by urban households doubled from 20 to 40 percent between 1995 and 2013 (figure 1). The underlying data come from the urban household survey that the National Bureau of Statistics (NBS) has conducted for many years. Unfortunately, a similar survey of rural households provides less disaggregated data. Several categories include both goods and services. The categories "household facilities, articles, and services" and "other goods and services" are clear examples. Figure 2 shows the estimate for the share of services in rural household total consumption expenditures, including in-kind expenditures.1 The upper estimate includes the value of consumption expenditures in the two mixed expenditure categories just mentioned, while the lower estimate excludes these expenditures.2 Although the range of the estimate for every year creates some uncertainty, two key points emerge. First, the share of expenditures on services by rural residents is somewhat below that of urban residents—no surprise since their incomes are much lower and the services expenditure share rises with income. Second, the services share of rural household expenditures also appears to have doubled between 1995 and 2013. The NBS revised the scope and methodology for its household expenditure survey in 2013 and began to report data on national average private consumption expenditures, disaggregated into slightly different categories. These data show that the services share of private consumption expenditures continued to rise in 2014. Bottom line: Retail sales are an increasingly unreliable proxy for private consumption expenditures. 1. Consumption in kind is relatively important in rural household expenditures, accounting for about 8 percent of total consumption outlays in 2012. Food accounts for almost all of the difference. 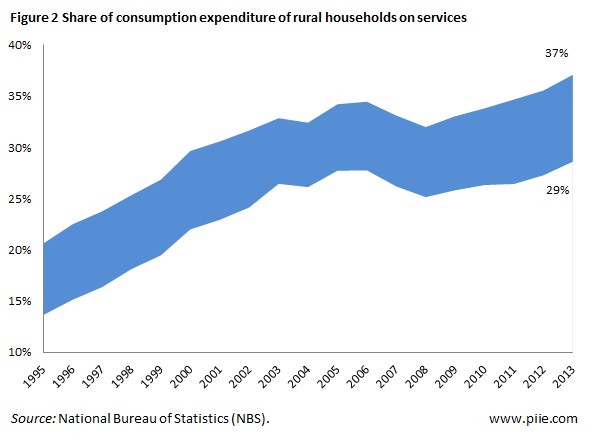 Thus an analysis of rural consumption based on cash outlays would show a somewhat higher share for services. 2. The upper end of the estimated services expenditures for rural residents is a slight understatement because it does not include food expenditures in restaurants, and tailoring and laundry expenditures, which are buried in the goods categories of food and clothing, respectively. However, it is likely that these omitted services expenditures are relatively small for rural residents. I look at fig. 1 and see no change from 2003-2013; a time of supposed re-balance.